Dr. Joshua Bowers, a recent graduate of Adena’s Graduate Medical Education (GME) Program, will begin his professional career at Adena Regional Medical Center as a physician with the Schumacher Group. Bowers becomes the program’s third emergency medicine resident to commit to stay at Adena following their residency. He joins Dr. Benjamin Trotter (2016) and Dr. Nisha Haque Budi (2017). Bowers’ decision to practice at Adena is the culmination of what the health system envisioned when the GME Program began in 2012. The intent is to keep talented providers who have trained in the region to continue practicing locally. Major contributors in Bowers’ decision to stay with Adena came from the opportunities he had while participating in Adena’s Residency Program, and while working in the emergency department. 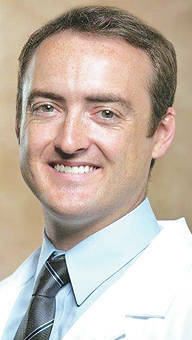 Bowers served as junior chief resident during his residency, allowing him to build relationships with medical students. He also helped facilitate some educational programing and looks forward to being a mentor to future residents. For more information on Adena’s Graduate Medical Education Program visit adena.org/graduate-med-ed. For more about Adena Health System and its services, visit adena.org or follow us on Facebook, Instagram, or Twitter @adenamedical. Submitted by Macey Power, communications specialist, Adena Health System.